From September 2003 pupils are required to answer two questions from a series of simple ” show me tell me ” questions on vehicle safety. If one or both are answered incorrectly, it would be assessed as one driving fault, which in itself would not constitute a serious fault. 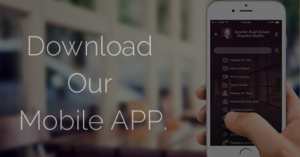 The information on this page will helps to illustrate the safety questions and answers required You can also Download DSA Car Safety Questions here. Check the oil on level ground, and before you start the engine to obtain a true reading. Remove the cap carefully and NOT when the engine is hot ! 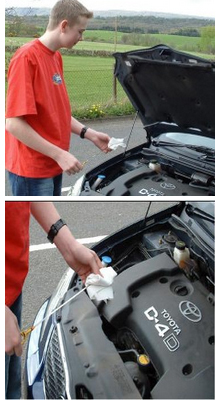 Before topping up the level, ensure the correct mixture of antifreeze and water are used. 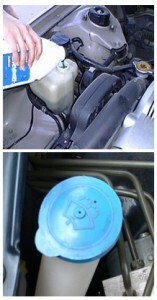 Check brake fluid level visually using marks on the side of the clear plastic container MAX / MIN. 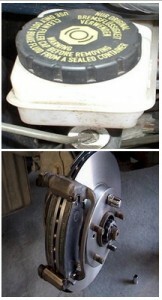 If you see the level as LOW, get the condition of the brake pads checked out by a mechanic. It may be that they need replacing and this could be the reason for the low level reading. A “spongy ” feel to the brake pedal will give an indication of problems in the system. Check the parking brake for excessive wear – demonstrate by applying the handbrake that it secures itself and is not at the end of the working travel. Most car light bulbs can be checked easily by switching on dipped headlights, hazard lights, and by applyiing the footbrake whilst someone checks all bulbs. If you are on your own, back up against a reflective surface and you can check if the brake lights are operating after you have had a visual check all round. Keep a cloth in your car to clean lights especially during winter so you can see and be seen. When replacing halogen headlight bulbs, make sure you do not touch the head of the bulb with your fingers.Touch only the plug end. 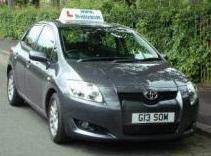 Make sure you know how to locate and operate – Heater / rear demist, lights, horn and wipers. – You will be marked on your ability to find these controls quickly, as weather conditions may change while on test. Image shows demister controls on the centre console.